We are a full-service web design firm located in Montrose, California with clients all over the United States. Our goal is to provide you with a web solution that will communicate the message you want. Websites can be fancy and nice (and ours are), but if they don't communicate or do what you wanted, they end up being pointless. We specialize in communicating your message the right way. Our services include Web Design, Logo Design, E-Commerce, Web Programming and much more. Click here for more information on these services. 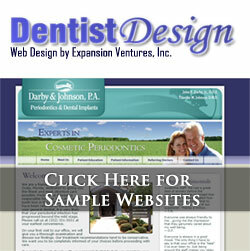 For the past 10 years, we've been dedicated to creating websites for dentists and optometrists. Here are a few sites that we've launched recently. For more examples, visit our portfolio section here or on our dental web design site, DentistDesign. Copyright 2000-2015, Bristol Web Design, Inc.